Food Friday – Fried bananas – the cause of Bangkok’s traffic problems? As I write this post I’m sitting in our Bangkok apartment devouring a bag of fried bananas – and I really should stop as I promised Nic I’d save him some. In a recent edition of the Bangkok Post there was an interesting article about fried bananas. It seems that police in Pom Prap Sattru Phai district of Bangkok believe that the cause of traffic congestion is the beloved fried banana. As much as I agree that these snacks are delicious and worth stopping to buy I don’t think you can blame a couple of stalls for the traffic problems in Bangkok. With 2 hour commutes for very short distances common place, more likely these vendors are taking advantage of an already existing problem. Kluay Khaek with fresh squeezed orange juice - perfect. 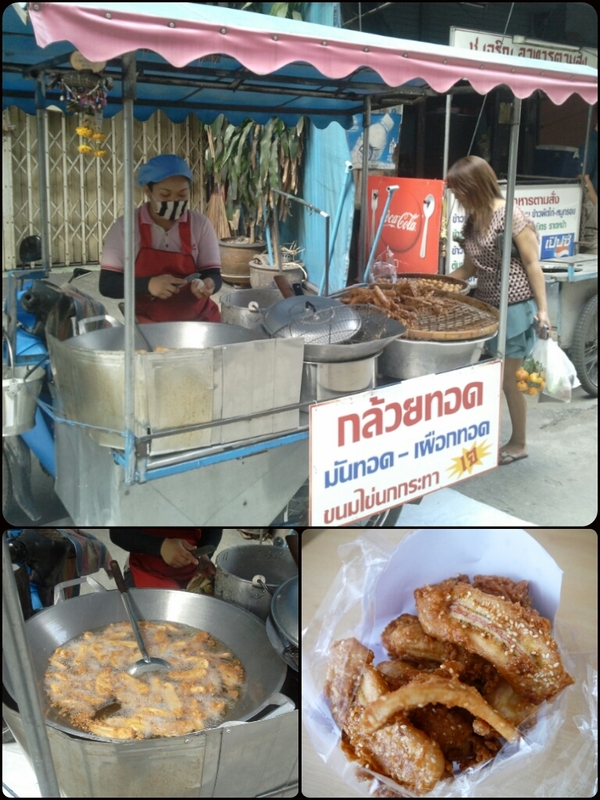 Fried Bananas (known in Thai as Kluay Khaek) are a delicious street food snack that are very moreish. They are both sweet and savory, covered in a batter of tapioca, coconut milk, sesame seeds and peanuts and then deep fried until golden brown. This lady below regularly parks her motorcycle/stall in the soi (Sukhumvit 77/1) around the corner from our apartment and small plastic bag full only costs 20 Baht. 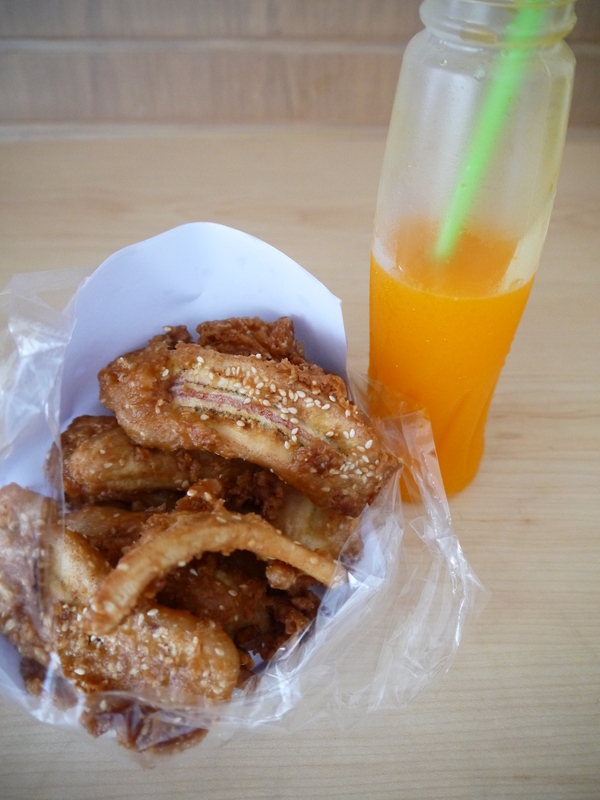 Main picture: fried banana stall. Bottom left: deep frying the bananas. Bottom right: finished product. 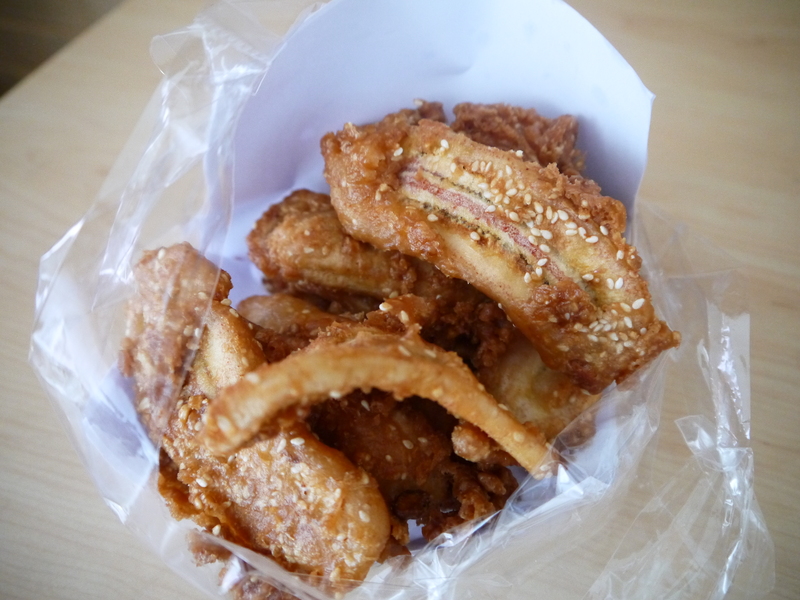 Nic and I first tried these fried bananas when we spent the weekend in Nakhon Pathom. We bought a bag as our on-the-hunt-for-breakfast snack and they were so good that after a trip around the block we came back for another bag – breakfast was served. And ever since I have found it difficult to walk past a stall without buying some.